Have you lost one tooth or a few consecutive teeth? Many patients tell us they didn’t think they needed to replace teeth if they couldn’t see the gaps in their smiles. Unfortunately, this is simply not true. In addition to the adverse impact tooth loss has on the way your smile looks, it also effects the function of your smile. When a single tooth is lost, the surrounding teeth have to absorb the added impact during chewing. This puts teeth at increased risk to be chipped or damaged. It also increases the level of wear to the teeth, diminishing enamel density and opening patients up to dental sensitivity, cavities, and other oral health concerns. To fill the gaps in the smile, teeth shift out of alignment. This can undo costly orthodontic treatment or lead to the need for these treatments. It’s time to call Legacy Trails Dental to schedule a tooth replacement consultation. 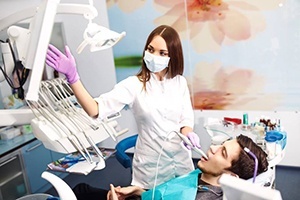 We provide patients a variety of restoration options, including dental implant crowns and bridges in our Plano dental office. Like the other implant supported tooth replacement procedures, the implant crown or bridge process is completed in several phases. The first phase of treatment is preparation. 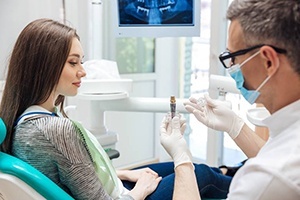 We’ll remove damaged tissues, provide bone or gum tissue grafts if necessary, and perform other treatment to ensure the highest levels of oral health before we begin the implant restoration plan. Then, we’ll schedule your surgical implant placement procedure. This surgery is minimally invasive. We simply make an incision in the soft tissue, and the implant post is placed into the jawbone. Over the course of several months, the implant posts fuse with the supportive structures. 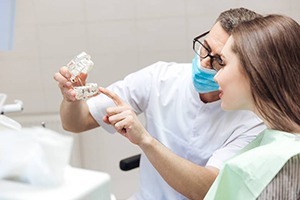 When the implants are firmly in place, you’ll return to our office, so we can design and place your flawless dental crown or fixed bridge restoration. 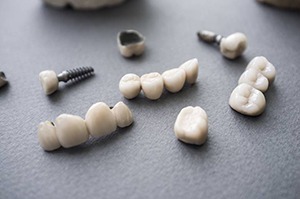 If you’ve lost a single tooth, a custom made, tooth-colored dental crown will be crafted to attach to an implant post. These crowns are affixed to the implant posts using abutment pieces that are attached after your implant has fused with the gum and bone tissue. Once the abutment is in place, we can capture impressions, design, and place your dental crown just like we would a traditional crown. To replace two or more consecutive teeth, we’ll use a fixed bridge prosthetic attached to two implant posts, one at each end. Fixed bridges are crafted by fusing together a row of replacement teeth. Like dental crowns, your implant retained fixed bridge will be designed and placed after the attachment of the abutments to your implant posts. Once in place, your implant-retained dental crown or fixed bridge can be brushed and flossed just like natural teeth. We may review your at-home oral hygiene products to help you ensure you’re using products that will cause minimal wear to the replacement teeth. Some of the things to look for include soft bristled toothbrushes, minimally abrasive toothpastes, and waxed dental floss. To remove plaque buildup between a fixed bridge and your gum line, you might want to consider using a water flosser or antimicrobial oral rinse. During your six month dental exams and teeth cleanings, we’ll be happy to partner with you to make the most of your at-home hygiene routine.